Try our South African style meat pies and sausage rolls, they are the real thing! 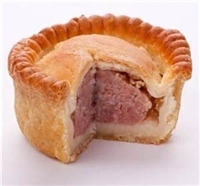 All Meat Pies and Sausage Rolls are pre-baked and frozen however they are still perishable and have to be shipped either FedEx Overnight Air or 2nd Day. For bulk pastry orders please call in your order to 704-849-2660 so that we can ensure that the product is available and that you obtain the best Overnight Air shipping rate. South African style Lamb Curry Meat Pies are perishable and have to be shipped per FedEx 2 Day Air This is the real thing and simply delicious South African style Steak & Kidney meat pies! This is also a perishable product please select FedEx Overnight Air or FedEx 2 Day AM for shipping. This is the real thing and simply delicious South African style meat pies! This is also a perishable product please select FedEx Overnight Air or FedEx 2 Day AM for shipping. Refer to Shipping page for details. This is the real thing and simply delicious! South African style chicken and mushroom pies in flaky pastry with a creamy sauce! This is a perishable product please select FedEx Overnight Air or FedEx 2 Day AM for shipping. This is the real thing and simply delicious! This is a perishable product please select FedEx Overnight Air or FedEx 2 Day AM for shipping. Refer to Shipping page for details. This is the real thing and simply delicious Bobotie beef! This is a perishable product please select FedEx Overnight Air or FedEx 2 Day AM for shipping. Refer to Shipping page for details.